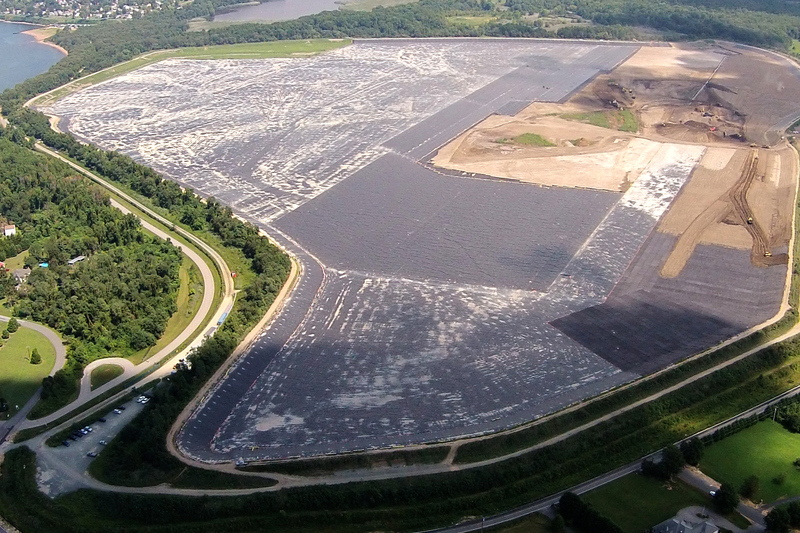 Allan Myers contracted us to provide and install the impoundment’s liner system during the summer of 2018. The exciting part of this water containment project was installing a different type of geosynthetic geomembrane—Coletanche ES4 HFA, which is a bituminous geomembrane manufactured by Axter Coletanche. Currently there have only been a select number of projects in the United States where this material has been installed. As the first installer on the East Coast to install this product, Hallaton is proud to be leading the environmental lining industry by staying on the cutting edge and installing all the various types of geosynthetic membranes that the industry has to offer. The bituminous liner is notable for its durability. This heavy-duty material is highly resistant to tears and punctures because it is a 5-layer system that’s combined into a 1-layer membrane. The owner selected the bituminous geomembrane that was utilized in the construction of the Bel Air water impoundment. When installing this type of geomembrane system, installers do not have to install multiple layers, thereby reducing the overall installation time. However, the challenge is that the bituminous geomembrane is 220 mil thick, compared to the typical 40 or 60 mil polyethylene geomembrane materials that are typically installed. The bituminous geomembrane rolls utilized on this project weighed approximately 5,000 pounds each. Instead of using a wedge welder or extrusion gun, we use an open flame torch that’s fueled by a propane bottle. The flame heats the bottom layer of the material and adheres it to the top layer, through a tar-like substance that squeezes out from the material. To test the seams we use ultrasound testing, which is different from our typical methods. We use a probe to ultrasound the seam every 150 lineal meters, ensuring that it’s a continuous, 8-inch-wide weld. The bituminous geomembrane is manufactured in France. It crossed the Atlantic Ocean on cargo ships, arrived at the port of Baltimore, and then was delivered to the Bel Air jobsite on trucks. Hallaton is proud to have been a part of providing the Bel Air community with more potable water by installing approximately 560,000 square feet of the France-imported material. After installing the product locally, we look forward to the next opportunity. The bituminous geomembrane has potential to be used in other environmental applications, such as solid waste and liquid waste containment, and roadways and ditches. Although this geomembrane is fairly new to the United States, it has already been installed in places around the world, such as Europe, Central and South America, and Canada. The bituminous geomembrane is ideal for cold environments. It can be applied even in frigid weather, unlike other liner materials.